There are many important collections of diatoms in herbaria all over the world and this is not a guide to all of them! A list compiled in 2003 by Hein De Wolf and Frithjof Sterrenburg is available. In these pages I give descriptions of three collections, from recent personal experience. One, not unnaturally, is the collection of c. 40,000 slides that I have buillt at the Royal Botanic Garden Edinburgh since my appointment to the institute in 1990. This collection contains not only my own slides but also those of Professor F.E. Round (University of Bristol), Dr Martyn Kelly, and others, and also an important 19th century collection amassed by Professor G.A. Walker Arnott. A second collection, which is documented here for the first time is the collection of cytological and other preparations of diatoms made by Professor Dr L. Geitler (1899-1990), now housed in the University of Vienna. Austria. I had the opportunity to examine this collection and make a preliminary catalogue during a visit in June 2009 funded by SYNTHESYS (a European Union-funded Integrated Infrastructure Initiative grant). 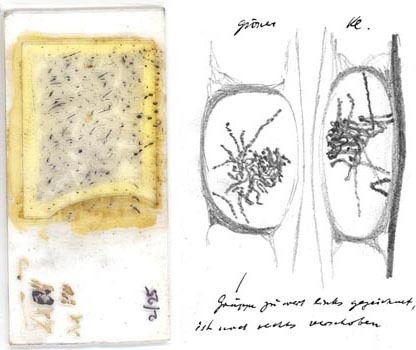 The image (left) shows slides and drawings made in the 1920s and used for Geitler's classic study of meiosis in Cymbella lanceolata. I also provide a guide to the Grunow collection of diatoms held in the Naturhistorisches Museum in Vienna, again on the basis of a SYNTHESYS-funded visit in June 2009. My aim is to help others to maximize any opportunity they may have to visit and use this important collection.